We overnighted at this city run park on Sept 21/09. Itch-Kep-Pe Park(say that fast 10 times ) is located on the southern edge of the small Montana town of Columbus. The 2nd loop is basically comprised of 'primitive' campsites, with no potable water or vault toilets that I saw. There are perhaps 15 campsites located in that section which is also bordered by the Stillwater Golf Course. Mainly RVs use this section and I would only use this section as a 'last resort'. The 1st, or 'main' loop/section of the park contains approximately 30, large, mainly grassy sites, with some adjacent to the river. There is one restroom with flush toilets and a tap along the back of it, for potable water. There are no showers, laundry facilities, or WiFi available, although 'Main St' is just a few blocks away. There is a train yard near by and while we heard trains in the afternoon/early evening, I don't remember them being a 'bother' during the night. 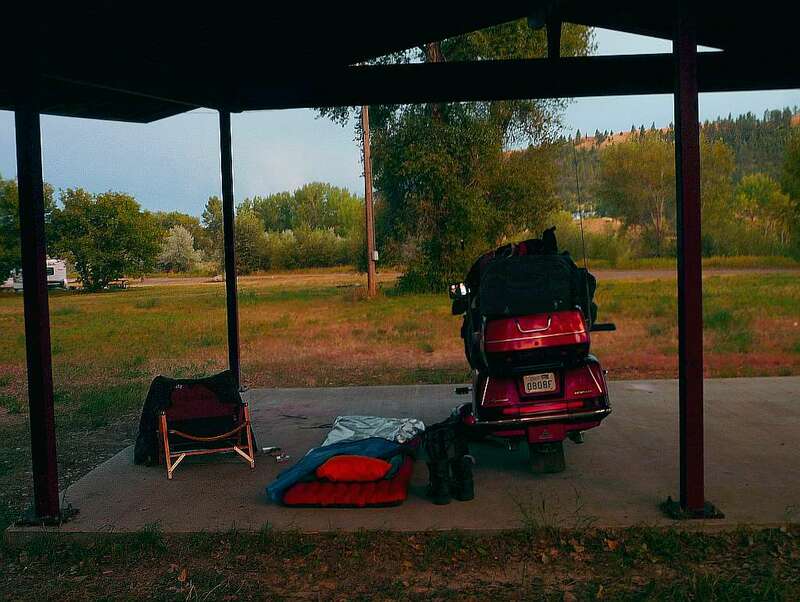 This campsite served our purpose for an overnight stay well, while riding from Yellowstone NP, to Glacier NP, via the Chief Joseph and Beartooth Scenic Highways. Sorry, ..... I forgot to take pictures of this campground. Just as I was approaching Columbus, a storm front was moving in, packing high winds, with a smattering of very large drops. 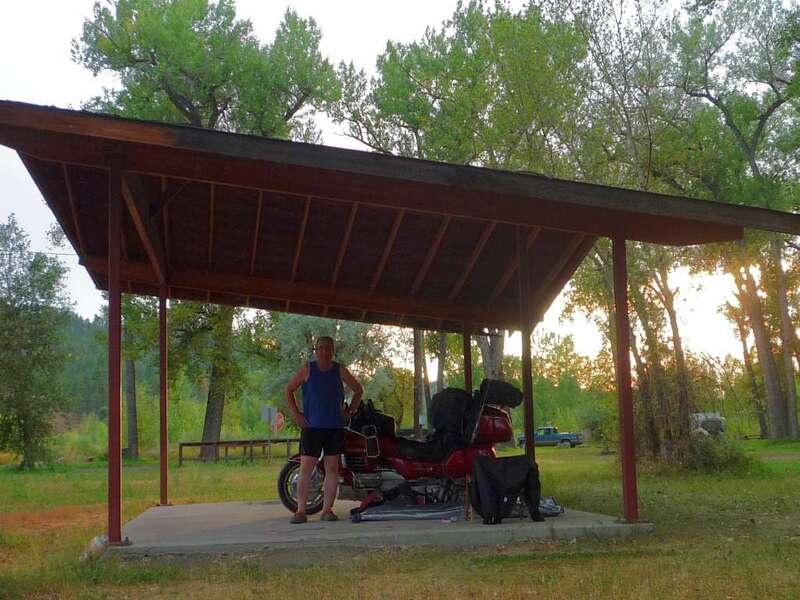 When I arrived at the park, lightning appeared, so I decided to make a very primitive 'camp' under the lone picnic shelter, rather than risk a large limb from one of the very large Cottonwoods snapping off and falling on me, or my tent. Conditions during my visit on Aug 26, 2011; - temps were 107*+, very windy, with rain threatening, although all we got was a few brief periods of a smattering of very large rain drops. Thunder/Lightning started up @ 9pm and contined all through the night, but seemed to be centred over the Beartooth/Yellowstone area, to the SW. Seeing as how I was just bedded down on the floor of the picnic shelter, I had a real 'visual treat' with all the lightning during the night! Cost was still free (and no trains were heard this time). TIP: - If you are headed to/from Red Lodge to ride the Beartooth/Chief Joseph/Yellowstone NP, SR 78 is a great road, with lots of fast sweepers, very little traffic and great views! you guys are great with all the knowledge about all this great roads and places to stay while away from home. Thanks Dusty, good info on the park. When I'm not in it, yes, he thinks it is. That would scare the cr@p outta me! Lightning and laying under that rooftop! I have a fear of lightning!......don't ask where I spent part of a night when the sky went green one night!HAHA! !